As dirt was moving to enabling the street in front of it to be repaved this morning, schematic approval was given for a new residential development along 1st Avenue South between 17th and 18th Streets by Birmingham’s Design Review Committee. The working name for the proposed S-shaped building, presented by CRD, RR, LLC, is Parkside Apartments. The proposal, which must now return before the committee for approval of materials and finishes in addition to final design, calls for it to contain 237 rental units, (22% of them 2 bedroom units), meaning as many as 286 residents living across from Railroad Park. It is estimated the $21 million project could break ground within the next 10 weeks according to David Austin, representing GA Studio this morning. The current proposal suggests a mix of metal panels, stucco, and brick veneer. Amenities for residents would include a fitness center, 2nd floor garden terrace, and pool. The $21 million project is slated to sit on the site once considered for construction of the Standard at Midtown, a $40 million 11-story development containing 145 units, a mix of both condominiums and rentals, proposed by Corporate Realty Development (one of the companies involved in this new effort) back in 2004. There were some concerns raised about the lack of retail spaces represented in the schematic plans reviewed by the committee. The working draft of the city’s comprehensive plan was referenced by one member as they pointed out the hope for more mixed use development opportunities to be undertaken, particularly given this site’s location across from the award-winning park. When asked by the committee to explain the situation, Austin from stated it was due to current market conditions, pointing to existing retail spaces currently vacant in mixed-use projects in the immediate area, including Cityville. Parking was also talked about, specifically in relation to the amount of space it takes up versus potential commercial opportunities. The schematic shows there would be two levels of parking accessible from the alley, a move necessary in order to accommodate one parking space per tenant. The plan shows street level would contain 131 spaces. The proposed 4 or 5 story structure would be the first project built since developers signed a compact in early 2010 committing to handling parking inside the block whenever possible. Time will tell whether this and other developments will resemble any of the conceptual proposals presented at that time. The Birmingham News recently shared the news that Century Plaza had officially closed (save for the Sears location which will still be open through June 14) effective Sunday evening. What should happen with Century Plaza? 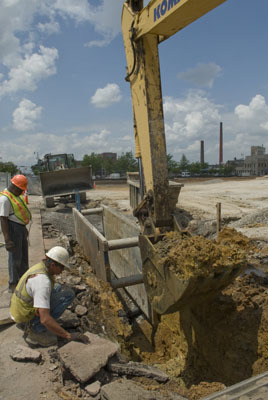 Workers dig a trench along 21st Street & Second Ave. South on Wednesday morning as work begins on the CiTYViLLE BLOCK 121 mixed-use development on Birmingham’s Southside. City officials (including Mayor Langford) and the developer gathered later that afternoon for the ceremony. The development is slated to include 255 apartments and more than 21,000 square feet of retail space, both of which will undoubtedly lead to a transformation of that part of the city. Check out the press release from the mayor’s office sent on Tuesday announcing the groundbreaking ceremony. Today demolition crews started tearing down the former homes of Jim Reed Books, Scott’s Koneys, FedEx/Kinko’s and the Birmingham Water Works to allow for construction to begin for the highly anticipated Block 121 development. The project, being developed by Corporate Realty Development and Inland American Communities Group is slated to include retail space and 258 rental units. The last tenant on the block, Express Oil Change, moved to its new location on University Blvd. earlier this year, while Scott’s Koney’s and FedEx/Kinko’s moved nearly a year ago.